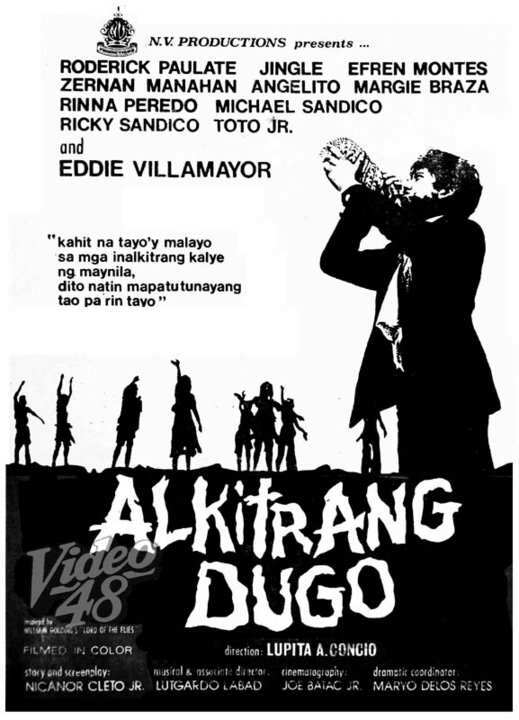 Alkitrang Dugo is a Filipino movie released in 1975 that was based on the dystopian novel Lord of the Flies by the English writer and poet William Golding (Pincher Martin, To the Ends of the Earth, The Scorpion God). The film was directed by Lupita A. Concio from a screenplay written by Nicanor B. Cleto Jr. The movie was produced by Nora Aunor. The cast of Alkitrang Dugo included Roderick Paulate, Jingle, Efren Montes, Zernan Manahan, Angelito, Margie Braza, Rinna Peredo, Michael Sandico, Ricky Sandico, Toto Jr., and Eddie Villamayor. The film was promoted with the tagline, "Kahit na tayo'y malayo sa mga inalkitrang kalye ng Maynila, dito natin mapatutunayang tao pa rin tayo." The movie was filmed in Lipanta, Padre Burgos in the province of Quezon. The movie's plot revolves around a group of young Filipino athletes who got stranded in a remote island after their plane crashed. The crash claimed the lives of their coach and pilot. Without an adult around to guide them on what to do, the young athletes organized themselves in order to survive. However, a struggle for leadership arose and divided the athletes into two rival groups. Alkitrang Dugo stayed true to the events in William Golding's novel with a few major differences. One, the movie had boys and girls stranded in the island while in the book there were only boys. And two, the boys in the book elected a leader right after the plane crash. In the movie, the athletes elected leaders several weeks after they got stranded in the island. Alkitrang Dugo was the second film to bring William Golding's classic story to the big screen. The first one was Lord of the Flies, a British adaptation that was released in 1963 and starred James Aubrey, Tom Chapin, and Hugh Edwards. The book was once again adapted to the big screen in 1990 by director Harry Hook. The cast featured Balthazar Getty as Ralph, Chris Furrh as Jack, Danuel Pipoly as Piggy, and James Badge Dale as Simon.